Canadian Cardinal Marc Ouellet, Prefect of the Congregation for Bishops in the Vatican, spoke at the Plenary Assembly of the European Bishops in Poznań, Poland. He was questioned by EWTN's Andrea Gagliarducci, "So far, we have been speaking about abuse. The Pope is summoning the world’s bishops together to discuss this in February. As Prefect of the Vatican’s Congregation for Bishops, what do you wish to say to the bishops of the world?" 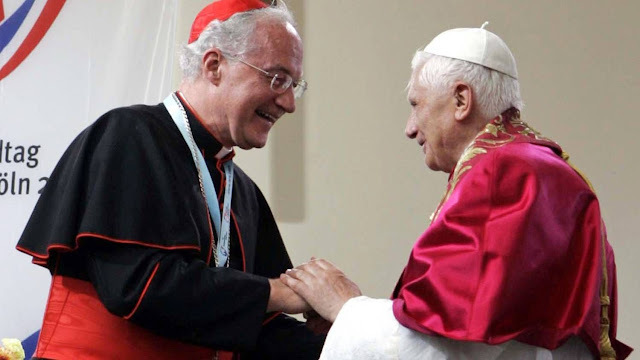 Cardinal Ouellet responded: We are facing a crisis in the life of the Church, a crisis at the level of leadership, of bishops, and also to a certain extent of rebellion. This is a very serious matter that has to be dealt with in a very serious way, not only in a political way. So, I think for example when there is a direct attack against the Holy Father, I think it is a very bad example and a very serious offense. And I do not think it is responding positively because it is also an unjust attack recently. It was part of my message, to the bishops of CCEE, to express solidarity with the Holy Father. It is a conditio sine qua non of solidarity between ourselves as bishops to bring forward the mission of the Church, and I am pleased to recognize that there is something being prepared on the part of this body, of the bishops’ conference, to express to the Holy Father this solidarity in this current context. Canon 1373 A person who publicly incites his or her subjects to hatred or animosity against the Apostolic See or the Ordinary because of some act of ecclesiastical authority or ministry, or who provokes the subjects to disobedience against them, is to be punished by interdict or other just penalties. "FOTALECE ME A TUA PRESENÇA"
para que essa luz esteja comigo em qualquer lugar. "ESSAS ESTRELAS SÃO MINHA DIREÇÃO"
ao sentir me com voz alimento me e nunca oprimo me!